This week, as part of my personal countdown to KCWC, I’m throwing pictures at the blog of things I’ve made for the kids this year that never got blogged. It’s my own little challenge, to try and “clean out the virtual closet” before I go and make more clothes for them next week. I’ll even show you some of the new kids patterns I’ve been working on. Fun Fun! Here’s another new pattern that’s also currently “in the works” — it’s so versatile that it works as a dress in summer and as a jumper over long sleeves in fall and winter. I decided to make this version a size larger than usual (it’s a size 4, she wears 3), so that in addition to wearing it this winter over long-sleeved tees with leggings and tights, she’ll be able to wear it next summer too. I just love this wrinkly soft black linen. So comfy. This kid. Cracks me up. I think the striped tee takes it quite nicely into fall, don’t you? Ooh, Rae! I love this dress! I look forward to the pattern release! And I didn’t comment then, but I also love the stripey shirt. I have a bit of a “thing” for stripes. This is so cute! 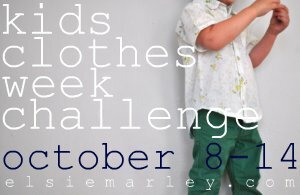 I love it when clothes can work year-round like that, especially kid clothes since they grow out of them so quickly. Layered with the striped shirt this is just perfect! oh yes. i reeeeally like this one. would be very versatile indeed. yes. ps, how does one sign up to be a pattern tester for you? So currently I have a “bank” of testers who I repeatedly ask for help testing from — after doing this for a few years now I have a pretty great group of people. I almost always put out a call for testing on Facebook though, usually for a specific size/age that I am missing in the primary group. So if you’re interested, keep an eye out over there! Oooh, love this design, Rae. It looks fantastic in this rendition with linen and strips. Adorbs! I love the linen fabric! I love this Rae! I see you have a bank of testers, but if one of them happens to call in sick- I’m your gal!!!! Is this the birthday dress?! Will this be a new pattern?! I’m leaping for joy!! I love it every way you’ve made it, and my girls will love it too; it’s so beautiful and I can see all the possibilities with this gorgeous pattern. Thank you, Rae! Ditto on the testers–if you ever need one, I’d work with this gorgeous pattern at a moment’s notice, it’s beautiful! Oh my goodness Rae, you are one smart cookie. Still loving the flashes of this patteren, can’t wait for it to be up. Please, please can it be with enough time for some Christmas sewing! (no pressure there!). I have a cheeky 27 month old daughter that I would love to make one for, and all my nieces and friend’s daughters!! If you need a pattern tester – PICK ME please!!! Love this Rae! Will definitely buy when it comes out! Is there any chance you could mention when this pattern is likely to be released?